During the First World War the barracks was used as an army recruiting centre. It is recorded that the wife of the Russian Ambassador, Countess Beckendorf, to Britain visited the Depot to see some prisoners of war held at the barracks. During the war, local ladies and wives of officers of the Regiment met regularly and arranged for parcels to be packed and distributed to The Red Cross for British soldiers held as Prisoners of War in Germany. The Regimental Museum was housed in The Keep above part of the Quartermasters Stores and the Regimental Association continued its work of arranging reunions, producing the Regimental Journal and care of the Regiments old soldiers and their dependants. 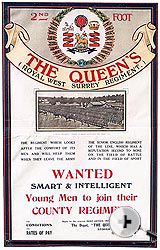 The Regiments title changed to "The Queen's Royal (West Surrey) Regiment. 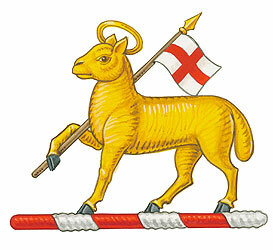 In 1924 the cap badge of The Regiment changed. Recruiting Poster. In 1924 the cap badge of The Regiment changed. 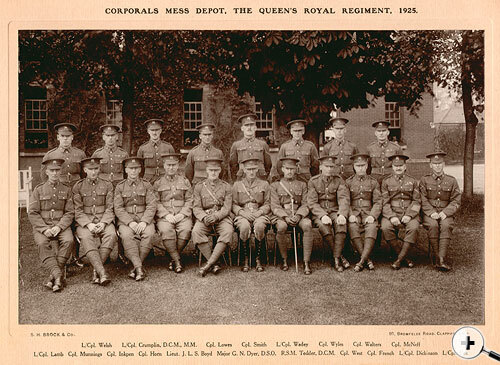 Corporals Mess Depot, The Queen's Royal Regiment. Open to public inspection as part of an army recruiting drive; over 3,000 visitors came and watched a special Band & Drums performance. A similar event was planned (& held) during 1933. Aerial view of the Barracks, 1935. 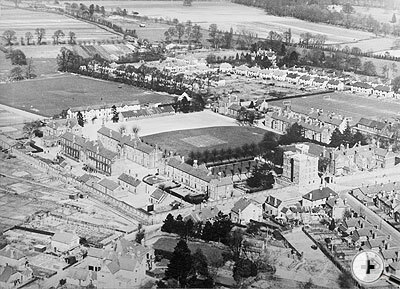 Major expansion and alterations to original Barracks; a new WO's &amp; Sergeants Mess, a Sports Pavilion and a new two storey block were built at the north end of the site which itself was extended to the north (where the sports field was laid out). Other structural changes and a general window replacement programme throughout the camp also occurred around this time.